This product is also available in a money-saving 5-pack. The Graphic Speller teaches graphing skills by having the students spell out words. 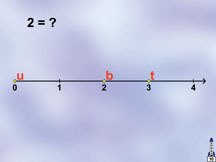 A set of letters is placed on a number line or graph. The student plots the given coordinates to find each letter in turn, spelling out a word. The program uses a girl's voice to prompt, reward and reinforce the student. Our "sassy speech" option makes learning even more fun! Note: This program does not teach spelling. 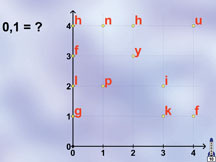 The Graphic Speller is a graphing program that uses spelling. The Graphic Speller works with keyboard, mouse, touch screen, track ball or up to three switches. The program has 9 levels of difficulty and dozens of options for teacher control.